View More In Long-Handled Tea Strainers. 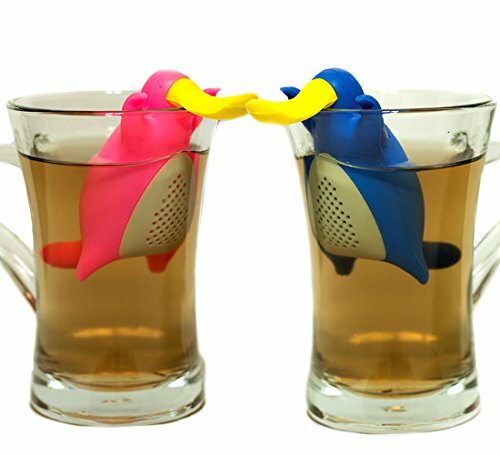 STARTING TODAY: Breathe New Life Into Your Cup Of Tea With The Most Adorable Platypus Couple Tea Infuser Set! Are you sick and tired of trying to strain your tea with the regular hard to use metal strainers? Do you want to enjoy a delicious cup of tea with fuller, richer taste? Meet The Amazing Happy Platypus Couple That Promise To Take Your Tea Experience To The Next Leve! No matter what herbs you like best, and no matter whether you like your tea in a kettle, cup, glass, tumbler or mug, the Happy Platypus Couple tea ball infuser strainer steeper set for loose leaves by Creatorstudio is here to offer a unique tea experience! These amazing tea infusers offer a richer, greater taste to your favorite brews as they allow all the unique aromas to escape, while every leaf bit is securely closed inside their little tummy. Unique Design Without Sacrificing Quality! Made of FDA-approved, non toxic, BPA free silicone, the quality of these tea strainers will never let you down! Feel free to use them daily in your tea for your unique herbal blends, without worrying about destroying your brew's delicious taste! With heat-resistant and stain resistant design, you can even microwave them or clean them hassle free at the dishwasher! A Wonderful Gift Idea For Any Occasion! If you are looking for a handy and yet adorable present idea, this is definitely for you! Offer this wonderful tea cup infuser set to any tea- lover and you will be praised for your unique choice. This set is great for birthdays, holidays, housewarming parties, weddings, Christmas gifts, couples gifts, tea gifts & more! Enjoying Your Hot Tea With Your Family & Friends Has Never Been More Fun! Don't Squander It - Your Satisfaction Is Guaranteed- Order Yours Today! THE CUTEST TEA INFUSERS: Great conversation starters for home or office. Stylishly packaged for housewarming and wedding gifts, or just to surprise your favorite tea lover They fit any size cup. GREAT DESIGN & EASY TO USE: Unlike regular strainers using these beautiful Platypus is easy as a breeze! Just pop off their yellow tammy, fill them with loose tea and hang them on the rim of your cup, glass, tumbler or mug! The tight mesh prevents any leaf bits from making their way to your cup! SUPREME QUALITY- SAFE TO USE: Made of food grade, non-toxic BPA Free silicone, you can use your new infusers with peace of mind knowing that they are completely safe for you and your family. DISHWASHER & MICROWAVABLE: Unlike metal infuser balls that rust or corrode, with your silicone infusers you have nothing to worry about. Dishwasher safe and you can use them at the oven and microwave to warm your brew. You can easy remove these infusers from your cup without scalding your fingers! GET IT WITH CONFIDENCE: Creatorstudio offers you a NO-HASSLE LIFETIME WARRANTY! With nothing to worry about, order for you or your tea-aficionados friends today! If you have any questions about this product by Creatorstudio, contact us by completing and submitting the form below. If you are looking for a specif part number, please include it with your message. Tea Infuser,Tea Strainer,2 PACK 304 Stainless Steel Water Filter with Double Handles for Hanging on Teapots, Mugs, Cups to steep Loose Leaf Tea and Coffee,Cold Brew Coffee Maker. FDA Approved.